WSU Vancouver in April 2016. Washington State University Vancouver is a campus of Washington State University, located on a 351-acre (1.42 km2) campus in Vancouver, Washington, approximately eight miles (13 km) north of the Columbia River and 17 miles north of downtown Portland, Oregon. Degrees offered by WSU Vancouver are conferred by Washington State University. WSU is the only "Research I" (RU/VH) institution in the Portland-Vancouver metropolitan area, based on the Carnegie Classification of Institutions of Higher Education. Previously an undergraduate transfer college, WSU Vancouver expanded to a full four-year university in 2006. WSU Vancouver in January 2014. 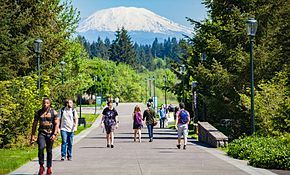 Washington State University began offering courses in Southwest Washington in 1983 as part of the Southwest Washington Joint Center for Education. In 1989, the University in Pullman formally established Washington State University Vancouver as a branch campus of the state's land-grant institution. The current Salmon Creek campus opened in 1996. In Fall 2006, WSU Vancouver admitted freshmen and sophomores for the first time and began offering lower-division courses. The 351-acre (1.42 km2) campus has many computing and research laboratories, including student computing labs, fabrication labs, science research labs, group instruction labs, fine arts labs, a circuits and microprocessors lab, computer-aided drafting lab and a writing center. The science resources and instrumentation possessed by the campus consist of GC/MS, HPLC (UVvis), DNA sequencer, TOC/N, RT-PCR, Flame ionization detector, two Phantom (high-speed camera brand) cameras, a scanning electron microscope, an Instron tensile tester, and a confocal microscope, along with a fully functional cleanroom. WSU Vancouver's library has more than 800 journals in hardcopy and over 9,000 full-text online journals and newspapers, a core collection of more than 30,000 books and access to more than 100 major bibliographic databases. The library participates in several local and regional library consortia, including the Portland Area Library System and ORBIS/CASCADE (the Oregon and Washington Cooperative Library Project). It also houses the Environmental Information Cooperative Library. WSU Vancouver offers bachelor's degrees, master's degrees, and doctorate degrees in more than 40 fields of study. Students may also be enrolled in science graduate study programs in the School of Biological Sciences in Pullman and pursue their entire degree at WSU Vancouver; greatly enhancing the number of degrees available at the master's and doctoral level by proxy. The opening of the Firstenburg Student Commons (FSC) in the Fall of 2007 marked a change in student life on the Vancouver campus. The FSC gives the campus a central place for students to congregate. It is equipped with a pool table, two ping pong tables, three 52-inch LCD TVs, and video game consoles. Although there is currently no on-campus housing, WSU Vancouver offers many activities and events for students. For example, there are many student-run organizations such as a History Club, Cougar Pride LGBT club and KOUG radio. KOUG Radio is a student-run radio station that occasionally features radio shows broadcast by DJs, most of whom are students at the university. Another student-run organization is the Salmon Creek Journal, a visual arts and literary magazine created by students, alumni and faculty. The 2,340-square-foot Fitness Center offers access to cardio equipment, weight-training equipment and fitness classes. Day-use lockers and shower facilities are available. In the novel Fifty Shades of Grey, the main character, Anastasia Steele, attends and graduates from WSU Vancouver. In response to this association, Avantika Bawa, a professor of Fine Arts at WSU Vancouver curated a 2013 show of student work titled 'Better Shades of Grey'. ^ Durbin, Kathie (May 15, 2010). "WSUV's first four-year class receives degrees". The Columbian. Retrieved 15 July 2012. ^ "Degrees, Majors and Programs - Admissions - WSU Vancouver". vancouver.wsu.edu. Retrieved 2017-04-11. ^ "Washington State University - Graduate Studies". sbs.wsu.edu. Retrieved 2014-02-26. ^ WSU Vancouver. "Salmon Creek Journal". WSU Vancouver. Retrieved 31 October 2012. ^ "'Better Shades of Grey' aims to shine flattering light on WSUV". The Columbian. 2013-11-27. Retrieved 2019-02-22.